In the early 1900s, Japan was becoming increasingly crowded because of its limited size. It needed more space to expand to and more land for resources. Manchuria had nearly 200, 000 square kilometres of land rich in mineral and agricultural land. Japan had invested large sums of money into the South Manchurian Railway Company. In order protect its interests, they were able to keep a large army in the area. When 1929 came, the depression hit the Japanese hard. One of its major trading partners, the USA, had cut off all trade, and so Japan needed to find somewhere to get its raw resources. To many, Manchuria seemed an obvious solution to all these problems, especially since many Japanese had a very low opinion of the Chinese, and so the army would not have to give any thought to the local populace whatsoever. There was another incentive for the Japanese to occupy Manchuria. After the Russian defeat in the Russo-Japanese war, Russia still held ambitions to expand into a warm water port. Manchuria would therefore act as a buffer against any future Russian attack. On September 19, 1931 an explosion on the Southern Manchuria Railroad gave the Japanese army the excuse it needed to blame the local populace of sabotaging the railroad, and to occupy nearby Chinese villages. The Chinese government complained to the League, who ordered the Japanese government to withdraw its troops. The order was ignored. Then the League established a Commission of Enquiry lead by Lord Lytton of Great Britain. The Commission recommended that Japan should leave Manchuria but that Manchuria should remain a semi-independent country instead of returning to China. 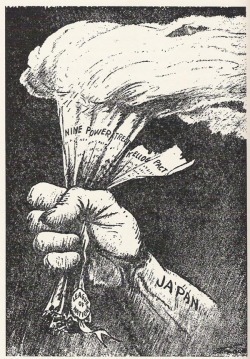 As a response to this Japanese withdrew from the League and finished the occupation of Manchuria. This conflict involved the concepts of: Confrontation, Internationalism, Cooperation, National Security, Regional Security, Global Collective Security, Alliances, Economic Security, Expansionism, and Conflict. This event proved to many that the League was useless. In the face of an aggressor, it could not do anything to restrain them. This showed the world that not only was it unwilling to restrain hostile countries, but also that it was not serious in its efforts to promote collective security. Since the League did not choose to take any action, either economically or militarily, it was seen as powerless if a major power chose to defy it. Also, Britain and France’s absence in this conflict showed the world that an issue so far away from Europe would not attract the notice of the European powers. As well, now that Japan had cut ties with the League nations it had only one other alliance to turn to- the other nations who had defied the League, Italy and Germany.